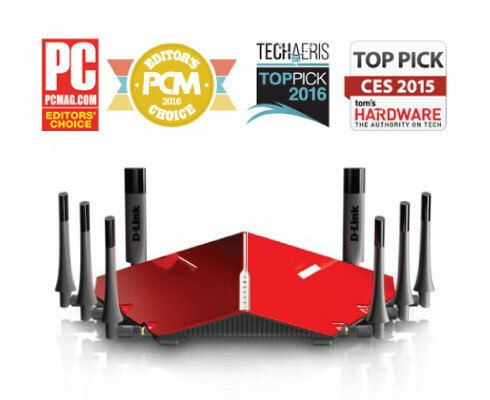 DIR-895L WiFi Routers - ACE Peripherals ::: Completing I.T. With NitroQAM™ (1024-QAM) technology on the DIR-895L, smooth streaming and low-latency online gaming are no longer a legend. Delivering a combing wireless speed of 5300 Mbps, you get the ultimate experience you ever need to have in a heated online gaming experience or live music concert in 4K/UHD. Bringing to you the widest coverage of up to 500m2 (5400ft2)4, with SmartBeam technology, coverage is automatically improved by directing bandwidth to your devices as you move around your home. You can stream HD video, surf the web, skype your friends and play online games from wherever you are so you’ll always get the best experience. To ensure that you get the best online experience via incredible network speed and coverage, DIR-895L provides the bandwidth and range for all your devices, from PCs to mobile devices and supports the different operating system such as Windows®m1, Mac OS®m2 and Linux®m3 and Android. Ensuring fuss free setup and surfing. 1. Windows is either registered trademarks or trademarks of Microsoft Corporation in the United States and/or other countries. 2. Mac OS®m is a trademark of Apple Inc.
3. Linux®m is the registered trademark of Linus Torvalds in the U.S. and other countries.